home, even if you maintain your house, at times there will be need for major investments in maintenance, repair or replacement. The district took similar steps to refinance old debt in 1998, 2003, and 2014, again saving taxpayers millions of dollars in property taxes. Keeping promises to citizens, voters, and taxpayers that growth by approving school construction measures to build new schools, or expand current schools. The new Risdon Middle School opened this year in the north end of district in Newcastle and Bellevue (Renton Schools boundaries go well beyond just Renton; encompassing seven municipalities). three-story, 550-student-school is moving quickly and on-time. The school will have flexible learning spaces that can be changed as the needs of students change; and that can be adapted to accommodate new, innovative technologies.The school will be a kindergarten-through-fifth-grade school and will have a Science, Technology, Engineering, and Mathematics (STEM) focus. Families from neighborhoods throughout the district can choose to enroll their child in the school. 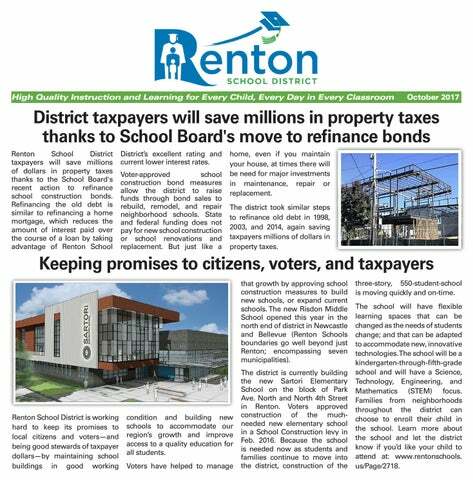 Learn more about the school and let the district know if you’d like your child to attend at: www.rentonschools. us/Page/2718. School District continues to partner with community, businesses to help provide well-rounded education system Renton School District recently teamed up with BECU credit union to help hundreds of high school students better understand how to manage money now, and as they mature. The credit union visited with Lindbergh High School students, introducing them to the­ financial realities of adult life through a detailed simulation program called “Closing for Good.” As part of the program, students are assigned a job and a financial profile — income, savings, and debt. Students use the profile to visit various stations to make ­financial decisions about the home they live in, transportation, food, healthcare, daycare, utilities, car insurance, and other monthly necessities and expenses that go into a typical household budget. The high school students quickly learn they spend too much each month, haven’t saved anything, and haven’t thought through the real cost of monthly expenses. Students work one-on-one with a BECU employees to rework their budget. The program helps students learn to balance a monthly home budget, spend income wisely, and save for their future. goal is to expand the program and provide a 1:1 device-to-student ratio for all middle and high school students in the 2019-2020 school year. This program, and all of the district's digital learning models, technology and many classroom learning tools, are made possible thanks to voter support of the 2016 Technology Levy. Above: Hazen High students, and thousands of others at district high schools, take the Prelimiary Scholastic Aptitude Test (PSAT) in class free of charge. Top left: Dimmitt Middle School students use their individual laptops to research a science project. Bottom left: Hundreds of district high school students are provided Sprint hotspot devices for home internet access. Schools continue improving family and community engagement, outreach efforts Schools throughout the district are continuing to improve their family and community engagement and outreach efforts. Like at Highlands Elementary School (pictured) where they recently kicked-off this year's Renton Parent University program. The course provides Highlands families with English lessons, helps them better understand their education system, gives guidance on how to work with teachers to advocate for their children, and provides strategies on how they can help their children continue learning at home. Helping lead this year's class is Silver Torres, who three years ago spoke very little English, and had no connection to the school his children attend. Silver took the Renton Parent course, and not only strengthened his English skills, but learned so much about the education system that this year he is teaching Renton Parent University courses to other parents. Renton Schools is committed to providing high quality education to every student, and to engage and involve parents in their children's learning. the Oct. 29 game when the Seahawks take on the Houston Texans. Nominate a great Renton Schools teacher today for recognition. Winners are selected based on their ability to make a real difference in students' lives; to go above and beyond in their day-to-day responsibilities; and to help students build life skills. Nominate now at Symetra Heroes in the Classroom www.SymetraHeroes.com/ Seahawks. Art, music, drama are important elements in students’ education Arts and music matter in Renton Schools and is being taught from preschool through high school. Examples include: Students in elementary schools are learning to compose music by using graphic notations to communicate musical ideas including pitch, rhythm, and expression. Elementary students use their art skills to create trioramas as part of a science unit on ecosystems. Other elementary schools have students experiment with different objects like marbles to learn different methods to approach drawing and painting. Lindbergh and Hazen high school marching bands performed along with bands from across the state at a recent University of Washington Huskies football game. Some of the instruments used by students were made possible thanks to the ongoing commitment to music and education by the Friends of Renton Schools foundation (http:// www.friendsofrentonschools.org). 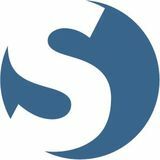 Study: Improved nutrition of school lunches lead to decrease in child obesity rates Renton School District was part of a University of Washington case study on improved nutritional meals at school. UW researchers analyzed 1.7 million meals served to 7,200 district students between 2011 and 2014, assessing the amount of nutrients such as calcium, protein, and fiber. They found that the meals' overall nutritional quality increased by 29 percent. Improved nutritional meals at school is credited in reported declines in childhood obesity rates, including 31 states reporting declining obesity rates among young children from low-income families.